Now I’m sure you’ve seen those ads in some of the online stores for those nifty ice trays that can be used for your hydration packs or water bottles. They’re pretty cool and I think its a great idea, but for the most part they are a bit on the pricey side. Some of the prices I’ve seen are anywhere from $9.99-$16.00, depending on the brand you get. However, there is an alternative. 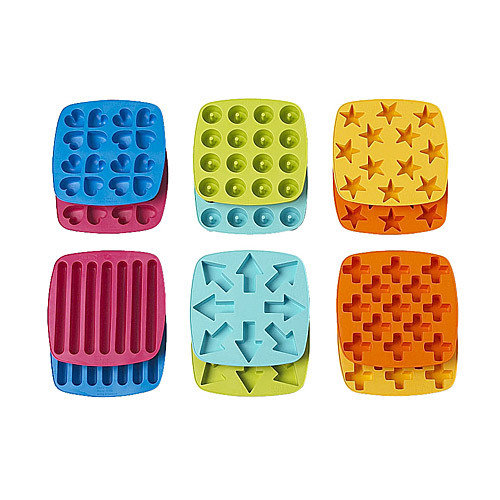 Priscilla and I were at IKEA and found these funky ice trays of different shapes. For the most part they are for kids. But look at the pink and blue ice tray on the bottom left corner. Don’t they have a similarity to the ones above? And guess what, they are only $1.99 per tray! So with a price like that, I bought my self a tray to see how well it works. I use the IKEA ones… I am not going to pay more than 1.99 Eur, for these. Normal Ice cubes work too.. but dont melt as quickly. Most of my german friends say i am crazy for drinking cold water. They say it will make me sick. I don’t know about cold water making you sick, but is there any reason to keep your water chilled besides preference? Just plain freezing a water bottle works best for me. It looks awesome. I am a water nut. I always need water. So I use to have my Hydration Bottle with me for ever.